Abdominal bulge, lax skin, stretch marks, and excess fat can all be an aftermath of pregnancy and weight loss. In most cases, no amount of exercise or diet can sufficiently resolve these changes. While it is quite common following several pregnancies, after twin pregnancy, heavy weight-gain pregnancy, or large birth weight babies, the laxity and bulge of the tummy can also frequently be seen after a single pregnancy with even modest weight gain. Weight loss and exercise are great, and they will result in a thinner you and better muscle tone. However, if your skin has grown to stretch over a bulk that you no longer have, it won't shrink just because the rest of the body has. A Tummy Tuck Surgery removes all of the extra skin on the front of your abdomen, and leave you with a smooth, lean exterior to match your reduced body mass. Tummy Tuck Surgery is a great option for women who suffer from a genetic predisposition towards loose skin. It is the surgical removal of excess skin or fatty deposits from the abdomen, along with the re positioning of abdomen muscles into a tighter formation. This bodily enhancement procedure is designed for those who wish to have a flatter and tighter stomach. It is a very popular with mothers who would like to fully recover from the effects of childbirth on their bodies. Tummy Tuck (Complete Abdominoplasty): In this procedure, an incision is made above the pubic hairline, another is made around the belly button, and the muscles that run vertically on each side of the stomach’s front wall are tightened. The skin removal and the muscle tightening are the most critical steps in improving the contour of the stomach. 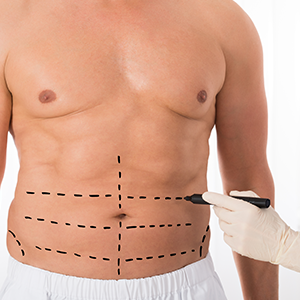 Liposuction may be performed along with the complete tummy tuck surgery, depending on the amount of fat that needs to be removed. Mini Tummy Tuck (Partial Abdominoplasty): A mini tummy tuck is done for patients who have mild to moderate stomach contour changes and have minimal excess skin and little weakness in the abdominal wall. Circumferential Abdominoplasty: If there is a large amount of excess skin and fat in the back and hip area as well as the abdomen, circumferential abdominoplasty is performed. This helps to improve the body’s contour in three dimensions. Lipo-abdominoplasty : Lipo-abdominiplasty is a Tummy Tuck Surgery in conjunction with liposuction, which provides for additional regional contouring (including flanks and hips) as well as improved shaping and sculpting of the mid line abdominal contour. The tummy tuck surgery will be performed in our certified and state of the art medical facility. Abdominoplasty generally take anywhere from 1 to 3 hours. The length of your surgery will depend on your body type and the amount of work that is required.You may be given an elastic bandage or compression garment to wear in order to minimize swelling to support the abdomen as it heals. Tummy tuck surgery is truly an artistic process, and one that takes into consideration all aspects of the fundamental elements of an aesthetic, attractive, natural waist and tummy contour. A relationship between patient, surgeon, and staff that is extremely warm, intimate, calming and comfortable. The procedure begins with general anesthesia. You will be completely asleep during the surgery. You can be discharged home the next morning after a abdominoplasty with a friend or relative. It is recommended that a two weeks off from work and strenuous activity be taken. However, on a select basis, return at 8 to 10 days may be possible. Resumption of light activities and lifting of light children begins at 7 to 10 days. As all sutures are dis solvable and placed beneath the skin surface, suture removal is not required. 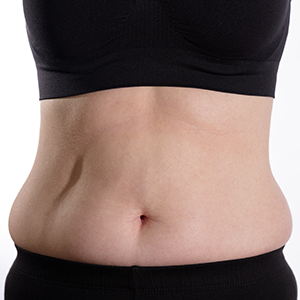 Swelling is generally present for approximately two weeks after tummy tuck, resolves substantially at six weeks, and final shape is reached approximately 12 weeks after abdominoplasty. Alluremedspa which is renowned for its state-of-the-art internationally acclaimed services,offers affordable and Value-for-money cosmetic procedures. To know more about the tummy tuck surgery cost in Mumbai request a consult by filling the form below. Your consultation is your chance to ask questions about tummy tuck surgery cost in Mumbai location and put your mind at rest. Alternatively, our counselor will call you at your convenient time. Request a consultation right away: Book an appointment. View More For Tummy Tuck Cost. To both assure the best cosmetic outcome and maximize safety, the very best Tummy Tuck surgery results can be accomplished in women who are at, or close to, their ideal weight before surgery. Excess skin at the abdomen. Localized excess fat of the anterior abdomen and flanks. Weak or bulging abdominal contour. Diastasis recti (midline separation of the abdominal muscles). A body weight within 10% of ideal, or BMI around 25. Dr. Milan Doshi will see you several times during the first two weeks post op and then periodically throughout the first year. He will advise you on the timing of return to exercise and unrestricted activity, and will always be available to answer any questions or discuss any matters regarding recuperation and activities following the procedure. Light exercise (elliptical, walking, treadmill) can be resumed around 10 to 12 days, and more vigorous exercise resumes at four weeks (core strengthening exercise can be restarted after approximately six weeks). The key to minimizing the potential complications and risks of an abdominoplasty is strictly following all of the guidelines that are given to you by your surgeon before and after the operation. After a tummy tuck surgery, you need to have a caregiver for the first 24 hours to drive you home, monitor your recovery and assist you with moving around. Note: We don't ask for any advance payments or deposits. We are pleased to offer and arrange comfortable lodging, restaurant, and commuting to ensure a memorable pre-and post-surgical experience for our out-of-country patients. Please feel free to contact the Counselor via info@alluremedspa.in for assistance with any of your travel and planning needs. During initial recovery, patients may experience swelling and bruising. Any discomfort can be improved with prescribed medication. After 5-7 days, stitches will be removed and your surgeon will discuss how to care for your dressings, shower and return to activities. It is important to start walking after surgery to prevent blood clots. You will be required to wear a compression garment to help reduce swelling and encourage proper healing. Tummy tuck surgery scars will fade over time and can be improved through the use of scar cream. After your tummy tuck procedure, you will have a flatter, firmer abdominal contour that is proportionate with your individual body type and weight. You will begin to see your new slimmer profile within one to two weeks after surgery. If you maintain a healthy lifestyle that includes a healthy diet and regular exercise, the results you obtain with your abdominoplasty should remain. Please remember that no cosmetic surgery procedure is a permanent solution, as your body will continue to age. At Alluremedspa, our support doesn’t end when you achieve your cosmetic and health goals. Lifelong follow-up with our multidisciplinary team is encouraged, helping you to achieve and maintain optimal results.For more information on hair transplant surgery and our extensive aftercare program or to schedule an appointment, call Alluremedspa at: +91 98690 41559. View More For Tummy Tuck Surgery Testimonials. This varies from patient to patient. If you have a job that requires physical exertion, you may have to wait from 2-4 weeks to return to work after surgery. Your doctor will discuss this with you during your consultation. Can I have Tummy Tuck between pregnancies? We feel that you should wait to have the tummy tuck until after you are finished having children, as this will help to both maximize and prolong the results achieved with the procedure. Are there any complications associated with Tummy Tuck surgery? If you maintain a healthy lifestyle that includes a healthy diet and regular exercise, the results you obtain with your abdominoplasty should remain. Are there any long term medical benefits of Tummy Tuck? Long-term weight loss: A study published in Plastic and Reconstructive Surgery journal has suggested that massive weight loss patients who had tummy tuck were more successful in keeping a healthy weight compared with their colleagues who did not undergo the procedure. The researchers have concluded that abdominal fat could play a role in satiety, and that by removing some of it through tummy tuck might contribute to long-term weight loss. In fact, three-fourths of patients who had the procedure reported an increased feeling of satiety. Separate studies have also concluded that the new figure is the main motivator for patients to maintain a healthier, more stable weight afterwards. Correction of ventral hernia: This condition happens when an abdominal tissue or intestine breaks through the abdominal wall, forming a “sack.” Oftentimes, it is triggered by massive weight loss and C-sections. Surgical correction of ventral hernia and tummy tuck share the same technique—i.e., strengthening the abdominal wall and suturing in place the loose muscles—although the latter provides cosmetic benefits as well. Improved posture. : Abdominal muscle weakness is known to cause lordosis, or swayback, in which the lower back has an excessive curvature. Over time, this condition leads to posture problem and back pain. Because tummy tuck surgery can also be used to improve one’s abdominal tone, patients with lordosis have reported better posture and relief from back pain after the operation. Improved bladder control: After vaginal birth, some women develop a condition called stress urinary incontinence, which can be triggered by laughing, sneezing, heavy lifting, and coughing. Proponents suggest that incontinence can be treated, or at least reduced, by creating a soft tissue near the pelvic region at the time of tummy tuck surgery. The ideais to construct a small “obstruction” to the bladder. Tummy tucks are popular surgical procedures, particularly after significant weight loss or pregnancy. But not all patients who are unhappy with the appearance of their abdomens fall into those categories. Patients with excessive fatty tissue and sagging skin below the belly button are also candidates for a less invasive version of the tummy tuck, known as a mini tummy tuck. What is difference between regular tummy tuck and mini tummy tuck? The principals of Tummy Tuck and Mini Tummy Tuck are the same. An incision is made just above the pubic area, excess fat is removed, muscles are tightened, then excess skin is removed. However, because less skin is to be removed and muscles require less tightening, a much smaller incision is required to perform this procedure (typically only about 10 -15 cm). Because less skin is to be removed, it is not necessary to detach and re-attach the belly button, which often is the case with a standard tummy tuck. This is where the term “scarless tummy tuck” came about. It is important to know that you will still have a scar from a mini tummy tuck; however, you will have no visible scars. The incision is carefully made just above the public zone, low enough to be able to hide the scar with underwear or a swimsuit. Recovery from a mini tummy tuck is similar to that of a standard tummy tuck, but is often-time a bit shorter because the mini tummy tuck technique is less invasive. After surgery, it is recommended to take at least one week off of work. You will be required to wear a compression garment for 2-3 weeks and may require a small drain to rid of excess fluid for about a week. It is important to refrain from strenuous activities for at least 6 weeks. Tummy tuck scars will fade over 6 months to a year after your surgery. Goal Can tighten the muscles in the lower abdomen Treat muscle separation above and below the navel and remove excessive or loose skin in the belly. Suitable for Those with an abdominal wall that doesn’t protrude significantly Women with stretched skin from multiple pregnancies or those who have lost a significant amount of weight. How much does a tummy tuck surgery cost in mumbai? For an estimate on how much tummy tuck surgery cost in mumbai, we recommend that you call Allure medspa on +91 9869041559 for our latest tummy tuck prices Or fill the form along this page.